As soon as Counting and Cracking begins, you know that you are watching something very different to most new Australian plays; and something very special. In a scene set on the Georges River in Western Sydney, a 21-year-old student called Siddhartha (Shiv Palekar) is somewhat reluctantly helping his mother Radha (Nadie Kammallaweera) release his grandmother’s ashes into the water, guided by a Hindu priest (Gandhi MacIntyre). 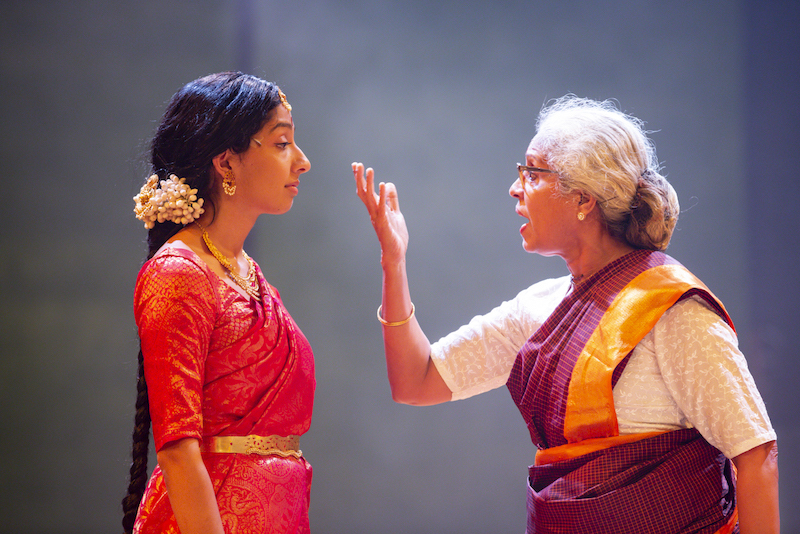 The dialogue moves between Sanskrit and English, with the Sanskrit translated quickly and seamlessly by other actors perched on the side of the stage. At the same time, the scene is also laced with local humour from the very Australian sounding Sid, who lives in Coogee, rather than at Pendle Hill with his demanding Amma. It is 2004 and Radha has refused to speak to her son about why she left Sri Lanka in 1983 while pregnant with him. With her mother now dead, Radha finally feels free to face the future and briefly contemplates accepting an offer to go out on a date with Ismet (Hazem Shammas) a Lebanese man who comes to install an air conditioner for her. Sid, meanwhile, is falling for a Yolngu girl from Yirrkala in Arnhem Land called Lily (Rarriwuy Hick). But then Radha receives a phone call from Colombo with the last news she is expecting and suddenly the past comes rushing back. Counting and Cracking is written by S. Shakthidharan, or Shakthi as he is generally known. Born in Sri Lanka into a Tamil family, his parents left there when the Black July riots began in 1983, starting the civil war that raged until 2009 between the majority Sinhalese Buddhists, and the Tamils, a Hindu minority. They arrived in Australia when Shakthi was three. His own mother Anandavalli (a former dancer who founded the Lingalayam dance company and is well known in Sydney’s Sri Lankan community) refused to tell him about her experience in Sri Lanka and encouraged him to immerse himself in the Australian culture. Ten years ago Shakthi began to do some research, visiting Sri Lanka and talking to numerous people. After a decade of research, writing and workshops, Counting and Cracking is the result. What’s more, Anandavalli became closely inspired by the development of her son’s play and is involved as cultural and costume advisor. The epic play, which moves between 1956 and 2004, with key moments also occurring in 1977 and 1983 (with characters from different time frames sometimes on stage together) draws on Shakthi’s own family experience and expansive research to tell a compelling story of Sri Lankan history and Australia today that unites the personal and political in powerful, moving fashion, creating characters that we believe in and care about. Moving back and forth in time, we meet Radha’s grandfather (Prakash Belawadi), a renowned Tamil politician known as Apah (meaning father), who believes that Sri Lanka’s Sinhalese and Tamil groups should live alongside each other and be allowed to speak their own language, with English as the official language, but who has to watch Sinhalese become the official language. We also meet Rhada’s husband Thirru (Jay Emmanuel as a younger man and later Antonythasan Jesuthasan) who goes missing during the violent riots, among numerous other figures. 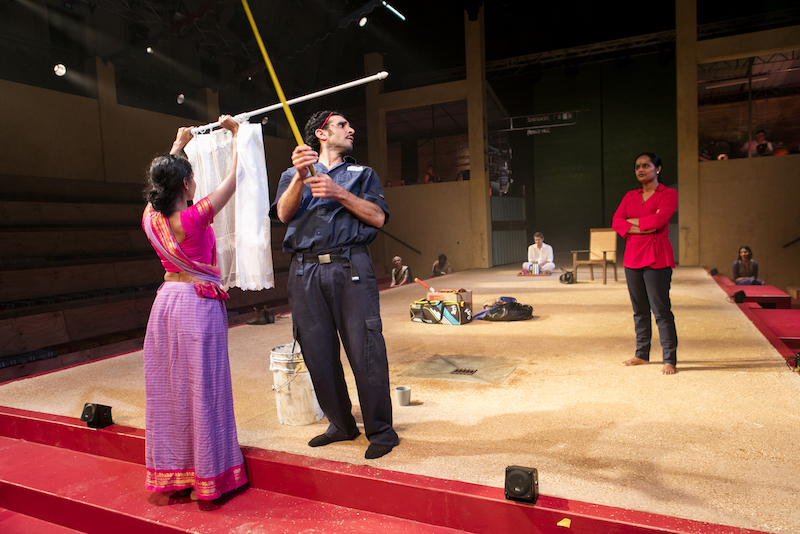 Running three and a half hours, with two intervals, the play features a cast of 16 actors from Australia, Sri Lanka, India, France, New Zealand and Malaysia, as well as three musicians, and is told (brilliantly) using six languages – English, Tamil, Sinhalese, Arabic, Sanskrit and Yolngu. Directed by Eamon Flack, Counting and Cracking is a co-production between Belvoir and Co-Curious, a company in Western Sydney founded by Shakthi, and is being staged in association with Sydney Festival and the Adelaide Festival. It begins to work its magic before you even enter the auditorium with a Sri Lankan curry given to everyone as part of the ticket price. 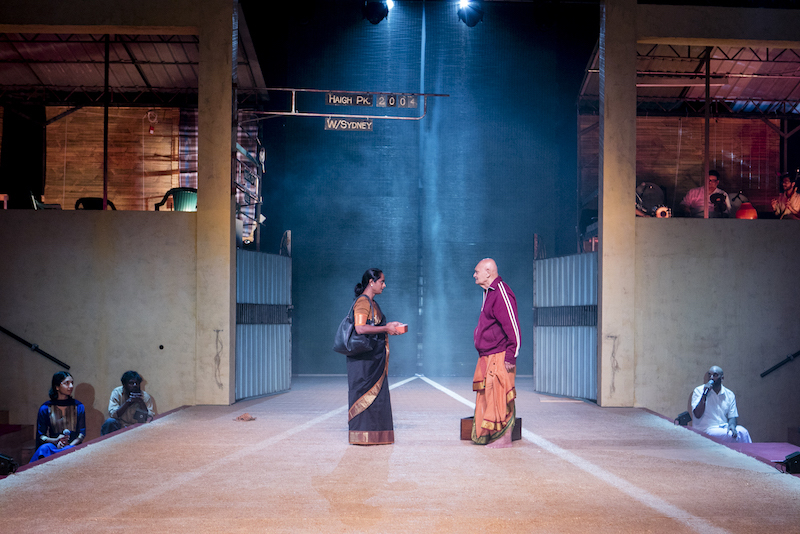 Entering the performance space, the staging – which suggests a Sri Lanka hall constructed within the Sydney Town Hall – immediately evokes the world of the play. Designed by Dale Ferguson, a large platform is surrounded by seating on three sides. At one end are a pair of large metal gates, through which the cast come and go and which act as the gates to Radha’s grandfather’s home in Colombo. The cast are also able to leave the other end of the stage through an exit between the seating. There are two rooms over the gated end of the stage, with the musicians in one of them. Colourful bunting hangs overhead. The first act has an ebullient energy and really flows, with Shakthi capturing both the Sri Lankan and Australian sense of humour in dialogue that feels very authentic. The second act, which explains the political situation in Sri Lanka leading to the civil war is quite dense, with a lot of information to take in, and feels a little slow at times, but the final act sweeps you up and leaves you feeling deeply moved. Exploring themes ranging from the exploitation of fear used to create political divisions, to love and family, the play could perhaps be tightened, and there are times when you are aware that you are being told information rather than seeing it emerge through drama, but it’s in exceptional shape for such a huge, ambitious new work. Flack and his team use a simple form of staging with a playful aesthetic, employing minimal but eloquent props to quickly set each scene that suits the piece perfectly, while an old-fashioned-looking sign tells us the year and location. Effects include buckets of water poured over Sid’s head and into a small hole in the stage to evoke the Georges River, and a large blue plastic sheet when Sid and Lily swim. Actors run on with a seesaw, a clothes line or a curtain on a rod for other scenes. When the riots start in 1983, Shakthi centres it around the telephone at the home of Radha’s grandfather, with calls from increasingly frantic people telling him and Radha that Tamil shops and businesses are being attacked, and that people are being burned on the street. Actors around the performance space, some standing among the audience, represent the callers. It’s beautifully done, and highly effective. The action is underscored by music and sound by Stefan Gregory, which draws on South Asian influences, performed live by three musicians (Kranthis Kiran Mudigonda, Janakan Raj and Venkhatesh Sritharan), while Damien Cooper’s dramatic, painterly lighting is stunning. After casting in several countries, Flack and Shakthi have gathered a marvellous cast, with strong performances across the board. Nadie Kammallaweera and Vaishnavi Suryaprakash are exceptional as the older and younger Rahda, and Sukania Venugopal has a lovely, no-nonsense warmth as Radha’s grandmother Aacha who is adamant that weddings are more important that politics. But all the actors deserve praise, with Nicholas Brown, Ahilan Karunaharan, Monica Kumar, Monroe Reimers, Nipuni Sharada and Rajan Velu completing the cast. 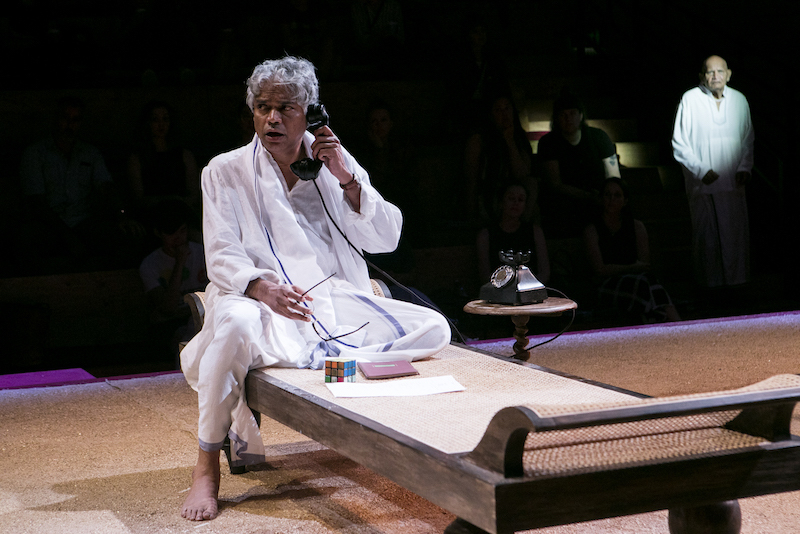 Counting and Cracking is exciting, groundbreaking Australian theatre that reveals a great deal about Sri Lankan history, and the resulting flood of refugees to Australia, that many may not know. The Sydney season is sold out (there is a wait list at the Sydney Town Hall box office) but tickets are still available in Adelaide. Snap them up now while you can. A rich portrait of a girls’ indoor soccer team that captures all the awkwardness, pain and joy of soon to be shed adolescence.